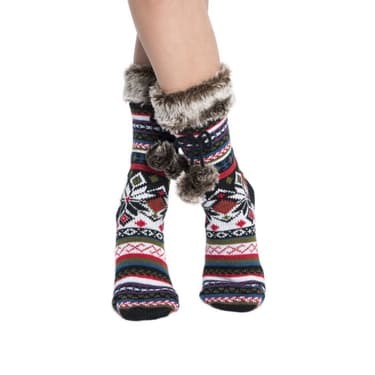 One Momma Saving Money: MUK LUKS Women's 1-Pair Patterned Faux Fur Cuffed Socks With Poms for $9.99 and FREE shipping. MUK LUKS Women's 1-Pair Patterned Faux Fur Cuffed Socks With Poms for $9.99 and FREE shipping. MUK LUKS Women's 1-Pair Patterned Faux Fur Cuffed Socks With Poms for $9.99 and FREE shipping. These are so cute and look super comfy. Casual or Dressy, you can’t go wrong with our Pair of Women’s MUK LUKS Socks. Available in Black, White and Red colors. Machine wash on cold gentle cycle, no bleach. Lay flat to dry.